of lexical stress and pitch accent detection, in particular for Computer-Assisted ... pronunciation lexicon or generating them automatically with a grapheme-to-. development in French-Portuguese bilingual children and explore the link between vocabulary ... total words in each language, the total vocabulary (TV) in each language ...... http://ec.europa.eu/public_opinion/archives/ebs/ebs_243_fr.pdf. eighteen consonants, which combine to form two hundred and sixteen ... to perform the basic speech processing tasks is implicitly present in the speech. French of Ijebu Undergraduate French Learners in Selected .... colloquial Brazilian Portuguese sometimes have [i] between consonant clusters, except. mation on spoken word production and the extent to which this influence is modulated ... a word's orthography information influences spoken word production only in tasks that rely ..... cient power to detect the effect. ... ä¹¦æ¬, /shu1ben3/, book. Levenshtein algorithms as leven-cohort algorithms. Fig. 2: Cost functions for leven-cohort algorithms (see the text in Section 3.1 for a detailed explanation). 2nd formant F2 of spoken word "Kreis"
Aug 5, 2016 - 400.0m. 50.0m. 100.0m. 150.0m. 200.0m. 250.0m. 300.0m. 350.0m ... spoken word "Kreis" in frequency range f = 200...300 Hz over t = 390 ms.
Hayes (1992), however, argues that the facts of assimilation can also be accommodated by a ...... N/M. Eddie was a (KEEN / BLEEN) basketball player / collector. 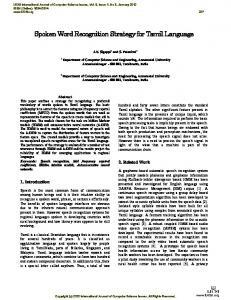 Author manuscript, published in "Corpus Linguistics, Liverpool : United Kingdom (2009)"
concerned by these successes of knowledge-based approaches: for the time being, Markovian models have not revealed a significant superiority on grammar-based systems in spoken language understanding (Pallet, Fiscus et al. 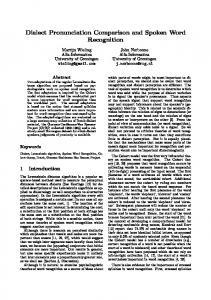 1994, Villaneau & Antoine 2009), and most of the research on stochastic dialogue modelling have been abandoned. The aim of this paper is precisely to show how corpus linguistics can help spoken language processing by providing knowledge-based parsers with some useful linguistic description. More precisely, we will investigate the question of word order variations which is of first importance for spoken language parsers. To what extent is conversational spoken French concerned by WOV? Do these WOV follow some general structural tendencies? Do language registers (Biber 1988) have an influence on WOV? What is the average frequency of strong variations, and consequently, are projective formalisms adapted to the parsing of task-oriented conversational spoken French? informed of their existence at the end of the conversation. The corpus is distributed freely on the Parole Publique website1. Finally, the UBS corpus was collected and transcribed by the VALORIA laboratory. It concerns real phone conversations between individuals and the receptionist of the switchboard and reception office of a university. The dialogues concern various topics, from a simple switchboard inquiry (e.g. may I talk to Mr X please) to a complex schooling question (e.g. I have a problem, the elective module I have passed does not appear on the transcripts). This corpus is also distributed freely on the Parole Publique website1. subjects, which cannot be considered as ordinary arguments in French, since the verb always agrees in gender and number with the subject, valence arguments which are the compulsory complements subcategorised by the verb, modifiers which usually correspond to adverbial complements, phrase complements which should be considered as modifiers of the whole speech turn rather than a direct complement of the verb. Table 2 − Frequency of occurrence of WOV (% of affected speech turns) in the four corpora. Table 3 − Distribution of the wov according to their direction. The table shows a strong pre-eminence of Ante-position on Post-position. Results are stable, with percentages of Ante-position between 82.5% and 89.3%. These results are not surprising since Ante-position is a classic way of topicalization in spoken French, as is shown in the studies of linguists who have studied spoken French, such as Claire Blanche-Benveniste and Françoise Gadet (Blanche-Benveniste 1998, Gadet 1989). According to S. Pekarek-Doehler, Anteposition is also used to intensify interaction between the speakers of a spoken dialogue: by signalling the link with the spoken expression in the previous turn, it points out the legitimacy of talking to the speaker (Pekarek-Doehler 2001). - Syntactic function of the extracted elements. – Syntactic function of the extracted elements as a diagram. le Cargo il est là là où il y a la la la demoiselle [OTG] (Transl.) The Cargo it is there there where there is the the the young lady. j'ai ma fille qui s'est inscrite [Accueil UBS] (Transl.) I have my daughter who registered. avant le six juin elle a dû dû valider un de trois voeux [Accueil UBS] (Transl.) before six in June she had to to validate one of three wishes. et à ce moment-là vous aurez une heure et une date [Accueil UBS] (Transl.) and at this moment you will have an hour and a date. la 'Science en fête' non non on l'a pas reçu [OTG] (Transl.) the “Science in feast” no we it not received. vous l'avez pas celui-là [OTG]. (Transl.) You have not it that one où vous les rangez vos grands sacs poubelles [Accueil UBS] (Transl.) where you tidy up them your big bin liners. Table 5 –Subject function and WOV type. Table 6 – Function Argument and WOV type. Pre-eminence of both Marked Extraction, as in examples (9c) and (9d), and Presentative Structure, as in example (9e), is less clear than for the Subject function and the results are more corpora dependent. Nevertheless, with numbers between 60% (Accueil UBS) and 80.3% (OTG), these two types are always more frequent that both Inversion (9f) and Binary (9g), whose frequency is contained between 19.7% (corpus OTG) and 40% (corpus Murol). si les diplômes on pouvait venir les retirer... [Accueil UBS] (Transl.) if degrees we could come to remove them. vous pouvez pas le perdre celui-là [OTG] (Transl.) you can not lose it that one. c'est ce que j'ai fait [Accueil UBS] (Transl.) it is what I made. oui AES elle a eu [Accueil UBS] (Transl.) yes AES she has passed. c'est pour quand votre location vous m'avez dit [OTG] (Transl.) it is for when your rent you said to me. Table 7 – Function modifier and WOV type. là je suis à Lorient [Accueil UBS] (Transl.) now I am at Lorient. actuellement j'ai des problèmes d'internet [Accueil UBS] (Transl.) Actually I have some problems with internet. vous prendrez votre billet à l'aéroport directement [Murol] (Transl.) You will take your ticket at the airport directly. c'est à la TAG que pouvez [...] vous pouvez la retirer [OTG] (Transl.) It is at TAG you can […] you can remove it. c'est où que je peux me renseigner [OTG] (Transl.) It is where that I can inquire. à la TAG vous pouvez la retirer (Transl.) At TAG you can remove it. Table 8 – Function phrase argument and WOV type . As a synthesis, Figure 2 compares the distribution of the four types of WOV (inversion, extraction, presentative, binary) according to the studied corpus. Figure 2 – Distribution of WOV types on every corpus. Table 9 –Distribution of the WOV to the syntactic function. We can observe a very low amount of non-projective extractions in all corpora, between 0.5% (Murol) and 2.3% (Air France). As a result, detachments leading to non-projective statements represent less than 0.4 % of the statements of our four corpora. This result is very important from a NLP perspective. It clearly shows that one should use projective formalisms to parse spontaneous spoken French. The resulting degradation of performance will remain very limited, especially when it is compared with the influence of automatic speech recognition errors. Ante-positions are preferred to Post-positions, Subjects are significantly more affected than arguments, while order varations also concern significantly modifiers and phrase complements, Most subject WOV are lexically (pronoun) or syntactically (cleft or pseudocleft sentence) marked, while modifier variations usually result in a simple inversion. Such results are very interesting for the prototyping of spoken language systems. In our opinion, they illustrate the contribution of corpus linguistics to natural language engineering quite well. Notes 1. Parole Publique website: http://www.info.univ-tours.fr/~antoine/parole_publique References Bartha, C., Spiegelhauer, T., Dormeyer, R., Fischer, I. (2006). 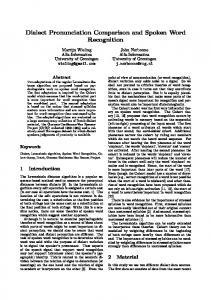 Word order and discontinuities in dependency grammar. Acta Cybernetica, 17(3), 617–632. Bessac M., Caelen J. (1995) “Analyses pragmatiques, prosodiques et lexicales d'un corpus de dialogue oral homme-machine”. Proc. JADT'95, Roma, Italia. 363–370 Biber D. (1988). Variation across speech and writing. Cambridge : Cambridge University Press. Blanche-Benveniste C. (1998). Le français parlé, études grammaticales. CNRS,. Covington M. (1990). “Parsing discontinuous constituents in dependency grammar”. 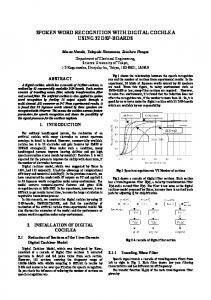 Computational Linguistics, 16(4), 234-236 Dudewicz E. J., Mishra S. N. (1988). Modern mathematical statistics. Wiley series in probability and mathematical statistics, New-York:John Wiley & Sons, NJ. Gadet, F. (1989). Le français ordinaire. Colin. Paris. Hale, K. (1983). “Warlpiri and the Grammar of Non-configurational Languages”. Natural Language and Linguistic Theory, 5-47. Holan T., Kubon, Oliva K., Plátek M. (2000). “On complexity of word order”. Traitement Automatique des Langues, TAL., 41(1) 273-300. Hudson R. (2000). “Discontinuity”. Traitement Automatique des Langues, TAL. 41(1), 15-56. Nicolas P., Letellier-Zarshenas S., Schadle I., Antoine J.-Y., Caelen J. (2002). Towards a large corpus of spoken dialogue in French that will be freely available: the “Parole Publique” project and its first realisations. Proc. Language Resources and Evaluation Conference, LREC’2002. Las Palmas de Gran Canaria, Spain. 649-655 Pallet, D.S., Fiscus, J.G. and al. (1994). “1994 benchmark tests for the ARPA spoken language program”. Proc. ARPA workshop on spoken language technology. Princenton: Morgan Kaufman, NJ. 5–36. Pekarek Doehler, S. (2001). Dislocation à gauche et organisation interactionnelle. in: Marges Linguistiques , vol. 2, 177-194. Pollard C., Sag I. (1994). Head-driven Phrase Structure Grammar. Chicago: University of Chicago Press, IL. Rambow O., Joshi A. (1994). “A formal look at dependency grammars and phrasestructure grammars with special considerations of word-order phenomena ”. In Wanner L. (ed.). Current issues in Meaning-Text Theory. London: Pinter, UK. Tesnière L. (1959). Eléments de syntaxe structurale. Paris :Klincksiek. Villaneau, J., Antoine, J.-Y. (2009). “Deeper spoken language understanding for manmachine dialogue on larger application domains: a logical alternative to concept spotting”. Proc. EACL Workshop on the Semantic Representation of Spoken Language, SRSL’2009, EACL’2009, Athens, Greece, 50-57. 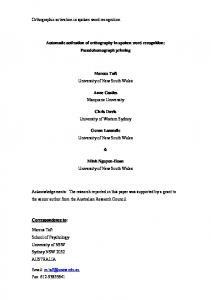 Report "Word Order Phenomena in Spoken French"